In my experiences, leather jackets for motorcyclists mainly fit into two categories. There are aggressive, loud, and very sporty racing inspired jackets, and bulky, heavy, and medium quality cruiser jackets that tend towards a more seasoned demographic. Searching for high end, heirloom quality leather jackets with subtle style and extreme attention to detail has offered a limited selection. However, that is exactly the market where Roland Sands Designs has looked to make a splash. They have afforded us all a new choice! New for 2014, the Roland Sands City Leather jacket is constructed out of Rifle leather, cut into a more slimming performance riding fit that will utilize rotated, pre-curved sleeves, as well as a relaxed collar opening and back flex gussets for comfort on the ride. Functionality is increased on this jacket with both a sleeve zip pocket, lined electronics security pocket, and stretch mesh cargo stuff pockets for additional carrying capacity. As with its fellow members of the RSD lineup, the City Leather Jacket is equipped to take specially designed RSD Forcefield armor at the shoulder, elbow, and back. Whether you chose the Black or Tobacco, this jacket really does arrive ready to impress! In a thick market of leather moto jacket manufactures, Roland Sands Designs has really carved out their own special place for riders looking for a subdued, confidently classic style without all of the loud branding that is often seen on other models in the same price range. 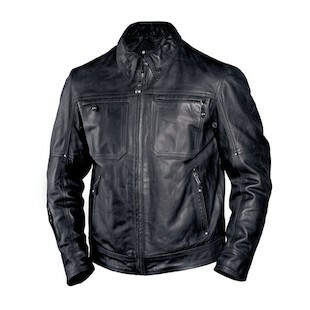 For the riders who choose to rock premium quality gear both on and off the bike, check out the RSD City Leather jacket.